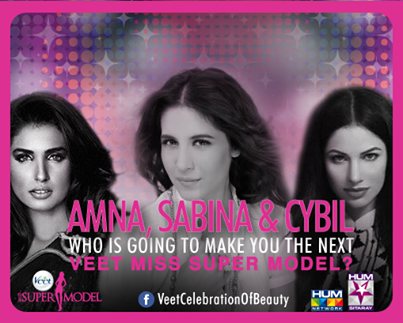 Veet Miss Super Model 2014 competition will likely to be on air on a local channel in mid May 2014 and participants from across Pakistan have already been selected. Model Wiqar Ali Khan accompanying with supermodels Amna Ilyar, Cybil Chaudhry, Sabina Pasha and Nadia Hussain said, “This year many things have been changed in the competition for title.” Many news happenings will be involved in programme and the programme will be showcasing 8 themed episodes and each episode will focus on grooming the models in various aspects of modeling based on beauty, confidence and personality development. He said programme would be hosted by him and every round would be an eliminating round on criteria level. The winner will be bestowed with the title of Miss Super Model as well as a precious modeling contract. Amna Ilyar, Cybil Chaudhry and Sabina Pasha will coach and mentor a group of contestants. The episode will showcase celebrity appearances from the fashion, TV and film industry besides they will judge the challenges by the aspiring models competing, Khan asserted. A representative of the Veet said, “We have created this platform to allow young women to turn their dreams into reality”. Veet Miss Super Model has established itself as a recognisable and renowned platform.